I hope you’re not getting tired of daily deals, because I’ve got more daily deal news for you, dear reader. Among the latest trends in the evolving daily deal model are the now popular “deal wallet” and “deal resale marketplace”, which quite a few startups have begun implementing, like City Pockets and DealsGoRound, to name a few. Another area of the deal model that seems to be going through a redux is the consumer driven deals (CDD) approach, in which sites are letting consumers determine what deals they want to see offered by their favorite local merchants. Ringleadr recently launched a service to put consumers in the cockpit, as did Loopt with its new “U-Deals”. The consumer driven deal (or reverse deal, if you prefer) has been poked at by startups before, without prodigious success, but that is not to say that there isn’t room left for iteration and disruption, as the space on a whole is still relatively young. While Ringleadr and Loopt are both offering great services, one of the potential drawbacks to the structure of their models is that consumers have to wait for 15 days (in the case of Ringleadr) for the merchant to approve the deal. This is after the consumer has gotten a crowd of friends excited about the deal, enough so to get past the tipping point, and then has to wait over two weeks for the merchant to maybe decide to approve. But, before going any further, here’s how SoBiz works: Users get 10 of their friends together to decide on a deal they want and the merchant they want to patronize. A user then posts that deal on SoBiz, at which point the merchant receives an email, text, and voicemail, alerting them of the deal. The merchant has 48 hours to accept, deny, or counteroffer. If the deal is accepted, the 10 users are immediately sent their coupons in an email and can pay for them using the startup’s secure payment system. From there, merchants have the ability to display the deal more broadly in the SoBiz marketplace, with the option to control the availability, and SoBiz in turn alerts members of the community that the deal is more broadly available. On the merchant side, SoBiz10 Director of Operations John Morgans said that the only thing businesses have to do is create a profile to become a member. After they’ve created a profile, there is a page to enable CDD notifications. Therein, merchants can create the fine print they want to appear on all of their deals as well as enter bank routing info for payment to be sent 2 to 3 business days after each deal ends. After agreeing to the terms, CDD notifications are enabled and they business will begin receiving CDDs, both those that are sent directly to them as well as those sent to their entire business category. Each time they receive a CDD they will be notified. Another selling point for the SoBiz take is that 25-cents of every coupon sold is donated to a charity of the deal-creator’s choice, adding a non-profit and feel-good element to the service, a la CauseOn. Each of the non-profits on SoBiz has a profile. At any time, they can log on and view on their dashboard to see how much money has been donated. When they are ready to withdraw the donations, they email SoBiz, which then sends them a check. Morgans said that they are working on automating this process as well. The other interesting part of the SoBiz platform comes from the fact that Founder and CEO Marion Mariathasan and team had originally built the service to be a social network, with a daily deal component as an add-on. As you can see from the image above, users and merchants can create profiles, just as one would on Facebook, write reviews of prior deals, connect with friends and merchants, and so on. The service also includes search functionality as well as deal categorization, so that consumers can request deals by category. If a user doen’t know who the best merchant is for, say, a new pair of reading glasses, they can go into the “Vision Category” to search for eyewear merchants. Categorization is an added bonus in comparison to Groupon and other deal sites — it adds a much-needed level of organization to the frantic world of coupons. Mariathasan compares the service to a kind of reverse Priceline.com, except in the case of Priceline, consumers are just reacting to the deals that Priceline has already negotiated, whereas automated consumer-driven deals puts the customer in the driver’s seat. SoBiz10 has been testing its model in Denver and Kansas City, with more than 17,000 consumers and 2,000 merchants participating. The startup recently forged its first big partnership with a national coupon-ing company, but is not yet sharing the terms, or the name of company, though two more are in talks with SoBiz. More to come on that. SoBiz is currently bootstrapped and seeking venture-backing to help bring its service to other cities. Lastly, the startup is providing TechCrunch readers with 100 free keys to the private beta, which you can take advantage of by emailing the team at contact@SoBiz10.com. 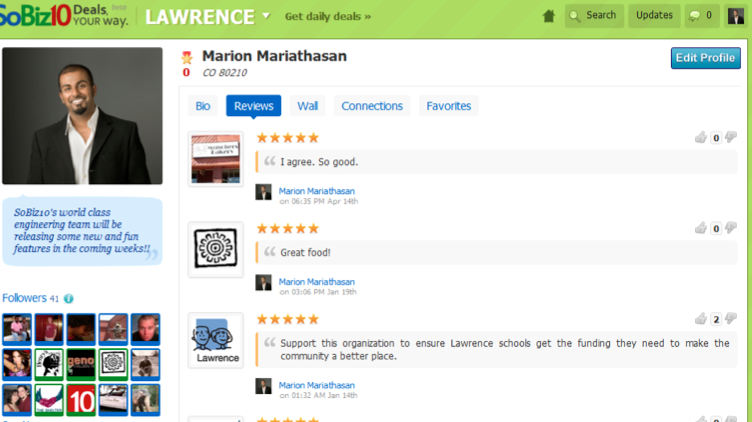 Mariathasan said that SoBiz plans to launch its public beta later this summer.